Top 10 @ NY Audio Show, New Demo Locations, Laminar Streamer news, and more! 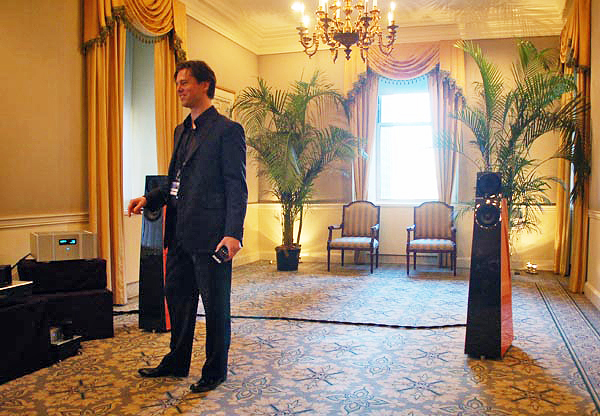 Success at the 2012 New York Audio & AV Show: LessLoss is included in the Top Ten. Redesigning our entire website: better presentation, more concise, easier to navigate. 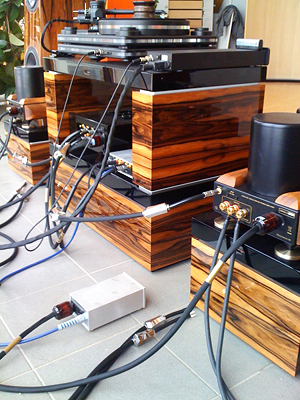 New venues to reach more audiophiles through more local demonstration. 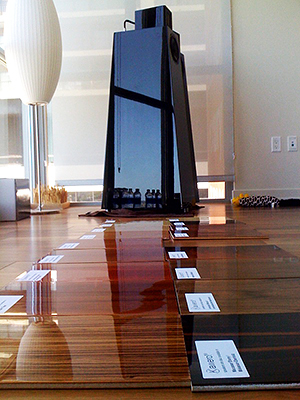 Laminar Streamer's extensive software and hardware development. 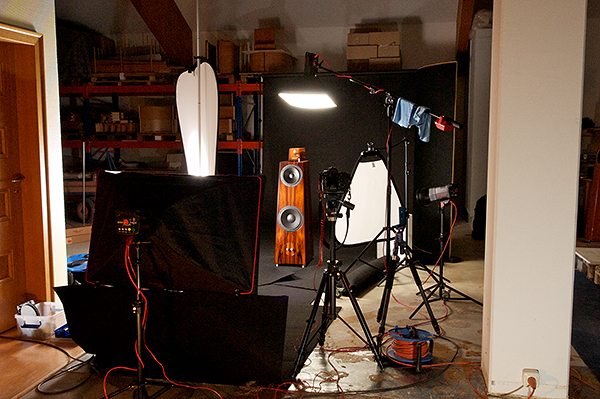 Behind-the-scenes work and the most elegant bespoke equipment stand we've ever seen. We had an excellent experience at the New York Audio Show this year. The venue was wonderful: the stately Waldorf Astoria on Park Avenue. The walls there are much more substantial than the typical drywall used in Marriots, Crown Plazas, Holiday Inns, etc., creating an ambience which is much more fitting to our audio art. The public was especially appreciative and well educated, and showed genuine interest in our technologies. I cannot tell you how many appreciative hands I had the pleasure of shaking, nor how many times I heard sincere praise for our sonic achievements. The experience was inspiring and we are going again next year. Hometheaterreview.com included LessLoss as one of the Ten Best Sounding Rooms at the New York Show. 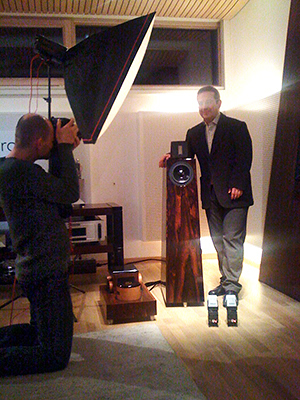 We were visited by Sound engineer, gear critic, and high end home theater consultant extraordinaire Jeremy Kipnis. Although he made several recordings as sound engineer with Chesky Records, he later became most known for his 6 million dollar home theater project. After listening, he stepped up to voice his interest in the Blackbody. In his extensive system, he really did everything, to attain you-are-there sound and image quality. He said that the Blackbody would likely represent the final frontier for him. Subsequent to our meeting in New York, I met up with him a week later at his own facility and we spent the day trying out the LessLoss Skin-filtering technology and Blackbody ambient field conditioning in his home stereo system. He was intrigued to the point where he felt compelled to try to measure this phenomenon. Expect an interesting review from him in the near future. As the assortment of our high performance products has grown, so has our website. Counting just the print-friendly PDF portion of our website, we have 61 pages of material. We go to great lengths to share our theoretical reasoning. To many, learning about the "How" and "Why" is as interesting as discovering the "What." We want to make it even easier for audiophiles to make sense of it all, so that our high performance products are not only noticed but also better understood. Therefore, we are in the process of redesigning our entire website from ground up. In near future, expect it to look better, be easier to navigate, and to be more cohesive and informative. We're entering into three new partnerships to further the visibility and hands-on experience of our products. These are Horizon Acoustics in Singapore, Avalon A/V Consultants in the Kingdom of Bahrain, and The Cable Company in Pennsylvania, USA. I wrote in an earlier Newsletter about how complex computer operating systems such as Windows, Linux, and MAC OS limit ultimate performance in high end audio. When time must be shared by a processor, simply raising the clock speed is not the high fidelity answer. It is the answer used by gamers, by typical program development, and other applications which do not seek the real-time continuous flow of completely laminar data feeds. Through clock sharing, Jitter inevitably arises. 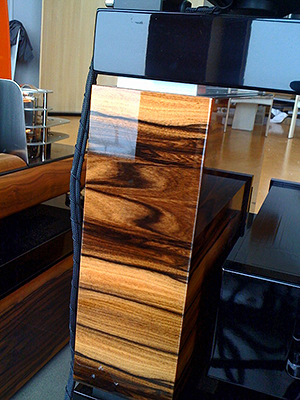 The Laminar Streamer's Operating System is streamlined and sculpted to 80 KB of code. Yes, you read that correctly. And not only is it that fine-tuned -- it actually runs on the audio clock itself, so that the data stream that leaves the Laminar Streamer is indeed born of the same clock that the Laminar OS runs on. This represents a substantial jump in performance above non-dedicated time sharing systems. Have you ever heard Absolute Phase Reversal, and how this can sometimes (depending on recording) lead to a more realistic depiction of the audio imagery and believability? There are unfortunately many otherwise excellent recordings which were released without regard to absolute phase polarity. Their data was phase flipped either by accident, or because the engineer didn't give a hoot to take the time to investigate, because he learned in recording school that "it doesn't matter." A prime example I can think of in recent history is Gavriel Lipkind's otherwise excellent recordings of the J.S. Bach Cello Suites. Once the absolute phase polarity is returned to normal, either by physically switching the polarity of the line or speaker cables in the system, or, digitally, by re-calculating the entire digital file, creating a new one, and playing it instead of the original, one experiences something akin to stepping out from behind the cello (as if one were playing it one's self) and coming up in front of it to appreciate all the musical nuance of bow direction, phraseology, projection, and pure imagery of the instrument in the actual venue. In other words, it is more real. We have now successfully implemented an Absolute Phase Reversal option as an on-the-fly, real time function of the Laminar Streamer, without introducing Jitter in the process. This doesn't complicate the operating system one bit, because, as we are the authors, we can easily write minus signs where we want. To a system which must spit out something, whether this something is positive or negative is of no consequence. All the quality lies in the timing, and since we know that, we engineered all of its functionality around that and only that. You will now be able to switch back and forth between absolute phase settings without missing a beat, in the digital domain, knowing that this Absolute Phase Reversal is done with the most fine-tuned Laminar OS available, with both settings offering the same super-low-Jitter performance. This means that no signal aberration is introduced and one can be certain that any differences in audio quality perceived will be directly derived only from the psychoacoustic influence that Absolute Phase has on our perception. Crucial work on the most sensitive part, the very heart, of the system, takes time to get just right. I emphasize again that in our high performance solution, the same clock runs both the Laminar OS and the audio stream output completely synchronously. This "locked" behavior is what gives us the closest thing we can come to in terms of a completely laminar flow of data. The next step is to figure out a clock technology which, now completely audibly exposed as never before, can live up to the task. 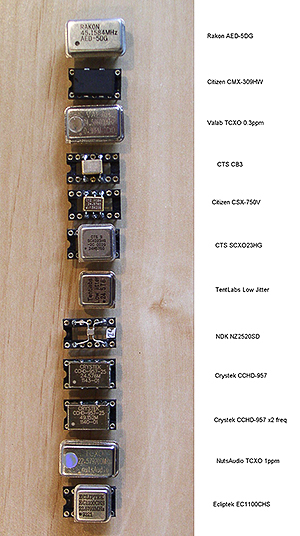 Many oscillators were investigated, many quartz types, many quartz cutting processes, as well as more complicated setups such as DDS (Direct Digital Synthesis) using super low Jitter 100 MHz oscillators from the Telecom Industry. It took time to really get to the bottom of clock operation. Nothing can be known with certainty until the stability of the oscillator's operation is first guaranteed. To ensure the stability of operation, the temperature must first be known to have settled. This happens only after some 20 to 30 minutes of operation. Multiply this by the number of oscillators you see above (about a third of what we've been working with), and you can easily understand that true progress does not come cheaply. Much patience is required throughout all of this investigation, and we thank you for sharing this burden with us! Much time was also consumed with the development of strictly applicable physical rules for design of the casing. Investigation of materials, of the schematics' placement and fastening to these materials, scrupulous attention to micro-vibration handling throughout the device all the way down to the footers -- all of these lead us through time-consuming experiments to make sure we get it right, and we are making good progress. We're achieving results which surpass even our wildest expectations. I'm sure you will also agree! Behind the Scenes Really Nice Stuff! 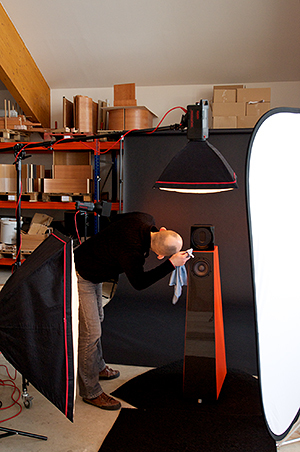 Recently, LessLoss travelled to the Kaiser Akustik facility in Bavaria, Germany, along with our professional photographers, who set up temporary shop there with a truck full of high end photographic equipment. For two weeks, we concentrated on high quality photographs. We must have come back with over 3000 photos to process. 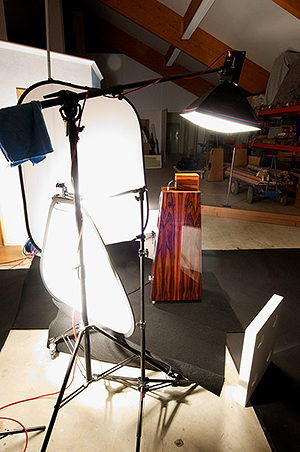 Here are some photos of a portion of the mobile studio setup with a Kaiser Kawero loudspeaker in the spotlight. 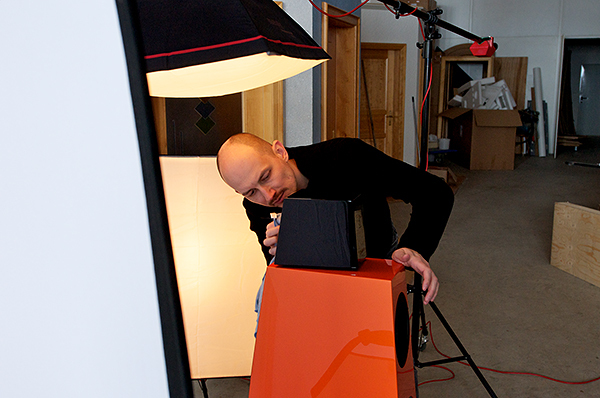 Here's our photographer in action, photographing acoustician Rainer Weber, "the man behind the loudspeaker." In this design, the solid Panzerholz shelves can be made to sit directly on sand granules of the sand-filled bottom supports. The concept is magnificently simple. The results are of a performance I have not encountered before. The noise floor just drops completely down. It makes one wonder what all of those "tuned" stands are all about. We don't want tuned instruments. For this, we want something akin to the sand at the bottom of the ocean. The Panzerholz shelves even include imbedded copper plates which can be grounded to the building's ground pole/wiring to achieve ultimate stability in both the physical and electromagnetic realm!